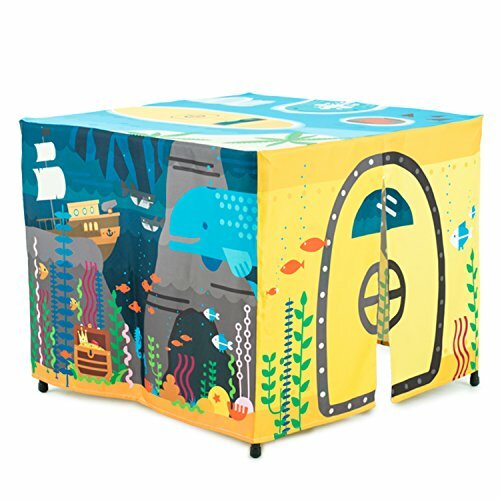 When you get a card table playhouse for boys, you are getting an item that is going to be played with for a long time to come. I love them for the open-ended, imagination-based play they provide! In this list you will find a wonderful selection of playhouses that your boys will really like. You know . 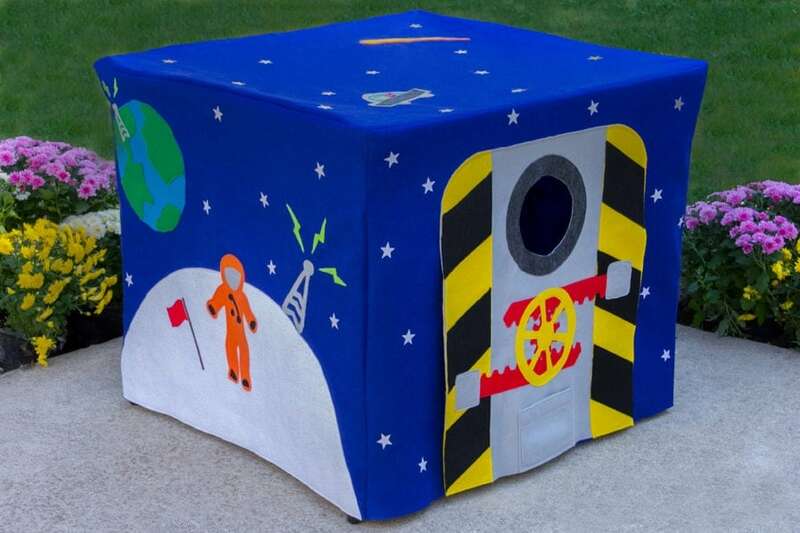 . . topics like pirates, space, vehicles, camping and animals! This pirate playhouse is packed with details. From the “Ahoy, Mateys” sign above the door, to the incredible treasure map on the back it is so well done. The treasure chest with gold coins is also a must see. 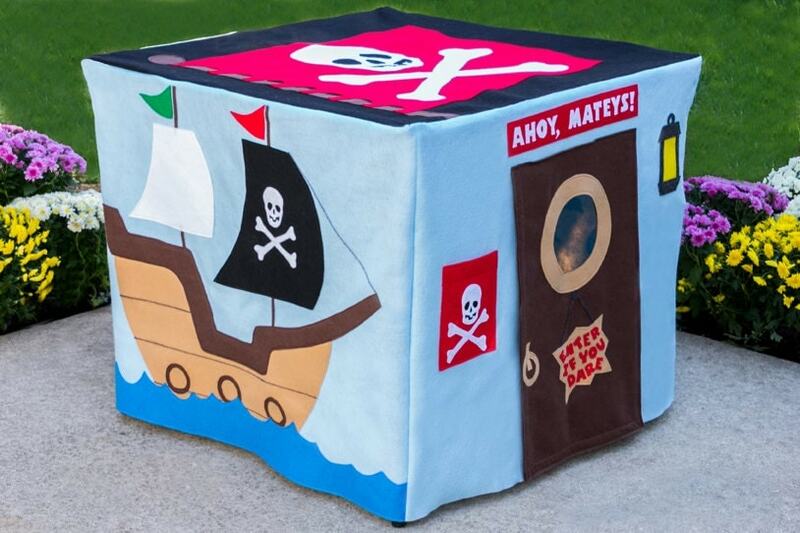 I think this one is a winner for sure and if you have a boy who loves pirates, I would most certainly take a look. Made of felt, it comes with a storage bag and 4 letters to deliver to the pirate mailbox. So cute! 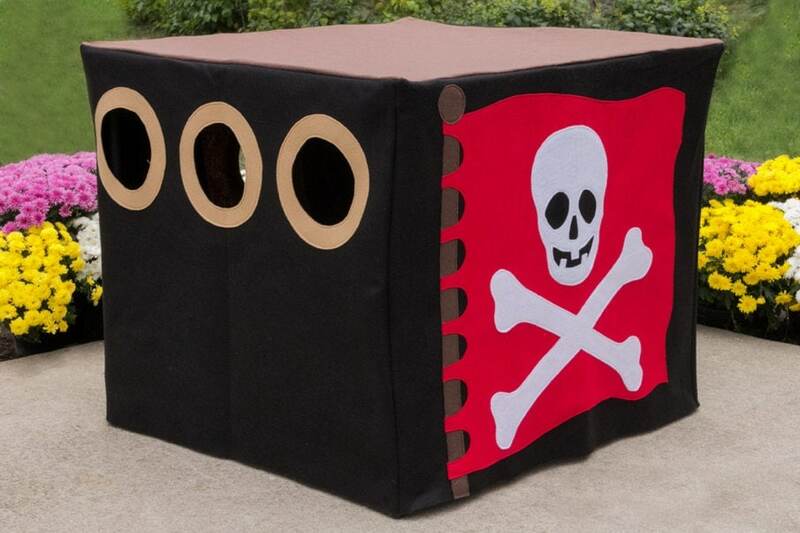 Every boy needs a hideout and this pirate hideout with portholes is just the ticket. Check out the big red pirate flag! The door says “enter if you dare” and you just have to see the detailed windows – perfectly pirate! This one is dark brown so it may be a bit darker inside than some of the others. If I could change one thing about this house it would be the top. Most of the others have a decorated top but this one is plain. Of, course that makes it perfect for playing with pirate figures (here are our favs) and making your own scenes so I guess it works out after all. Boy! I was excited when I found these space covers. Since space is a popular topic but harder to find, I know some of you are really going to be glad to see them. Look at the colorful pictures! You slip into your rocket by the door on the right. The back looks like a rocket and has a couple of round circles which are suppose to be rocket windows but they don’t open (kind of a bummer.) For the price, one can’t complain though because this rocket is a bargain. This cover takes space exploration to the next level. Your boys will be using their imaginations while they pretend to be great astronauts traveling to another planet. 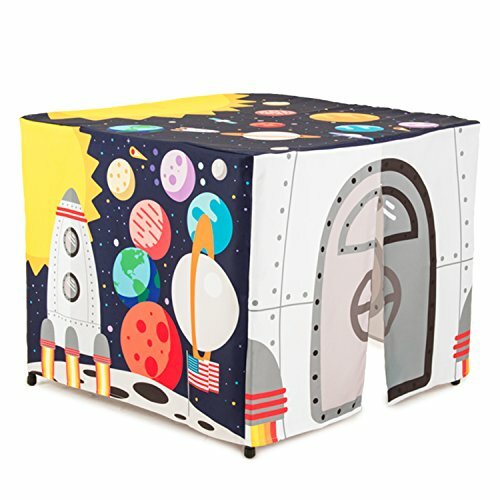 The big rocket with flames coming out the bottom covering the back of the unit is fantastic! It is bright red and even has a window in it. I really like the color of the felt she chose. Everything about it is well done. You have to see all of the sides! There is a little alien in a spaceship on the back. I can just see a young boy running his cars and trucks through the car wash again and again and again. 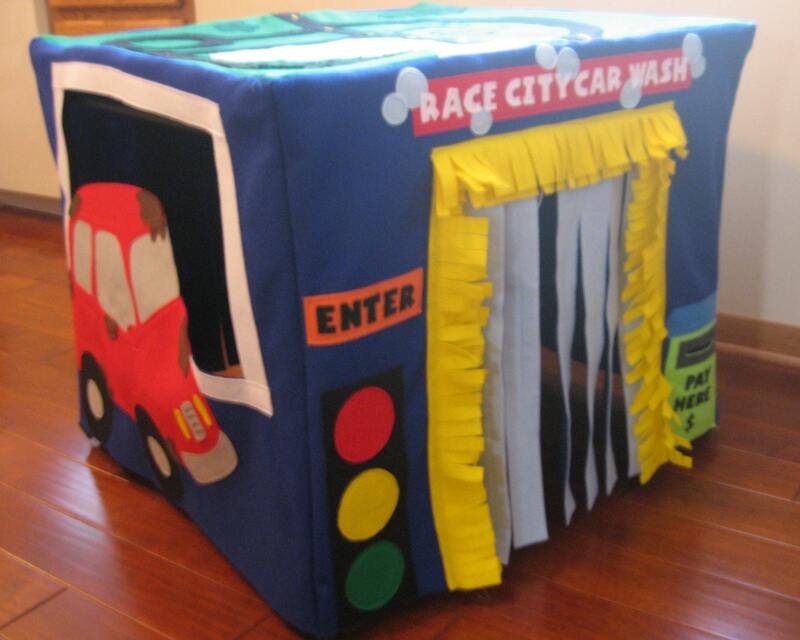 The back even has an exit with some black flaps hanging down, just like a real car wash. So cool! On the side you can’t see there is a green car going through the car wash with soap on top of it and water spraying. With a huge fire engine on the side it is easy to see who this cover is for! The door to the fire station rolls up so you can go in and out and there is even a mailbox (with letters!) and a storage bag. On the back you will see a cat stuck in the apple tree! It comes with some apples you can stick on the tree and take back off for more interaction. This one has a lot of play value. Go here to see all the sides. 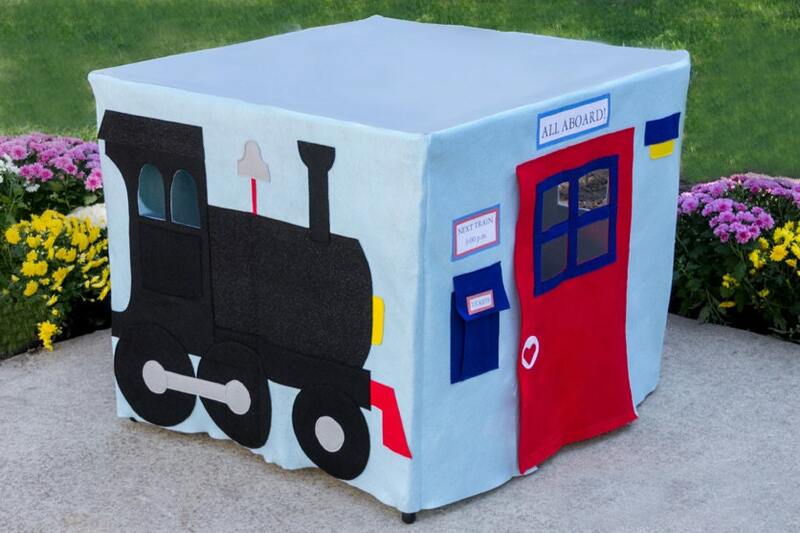 The train station is made with light blue felt and has a train running around the sides of the cover. The engine has special sparkle felt which is a little hard to see from the picture so I wanted to point that out. It makes it even neater. Your boys go in through the door of the station and can play train ticket master or be the conductor! 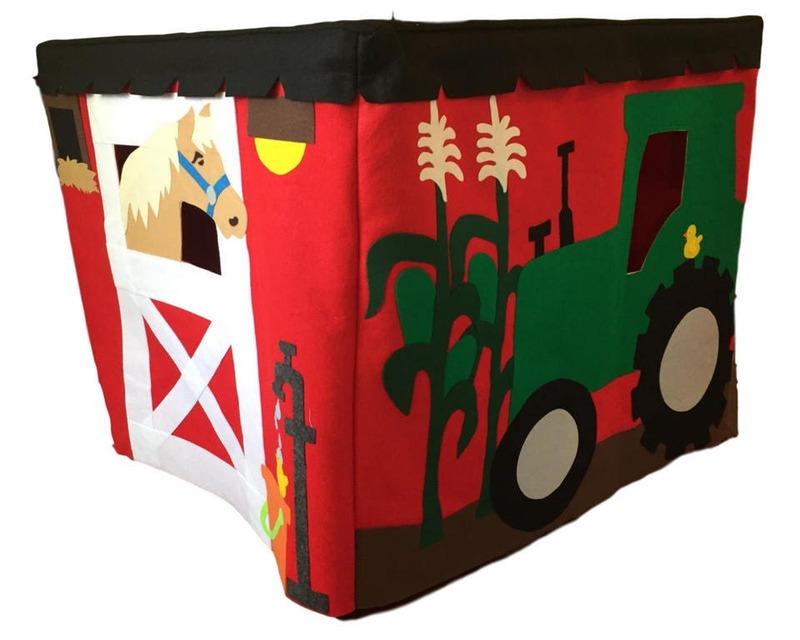 The back has an apple tree with removable apples (included) as well as pocket so your boy can include stuffed animals or other items in the cargo cars. There is even a caboose! Perfect for train enthusiasts. 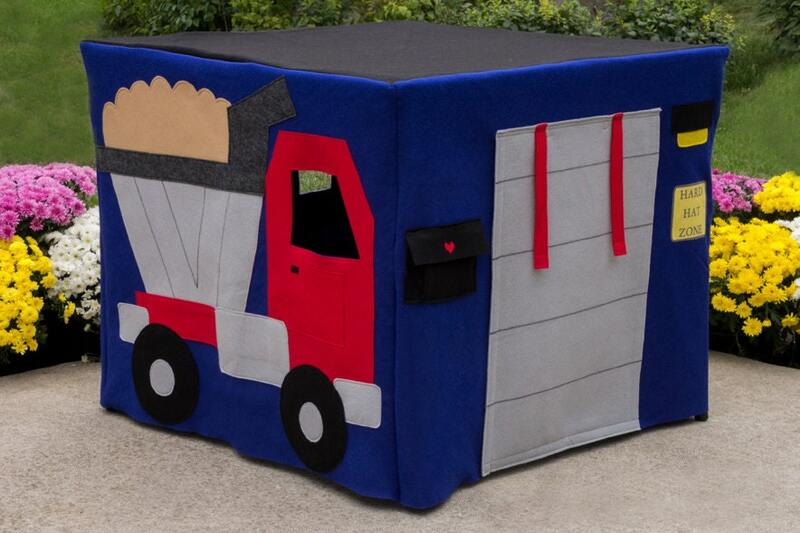 I knew I had to find a truck playhouse because construction trucks is such a popular theme with boys. I think this nice one will do the trick. The door rolls up and is held in place with the hook and loop straps you see hanging down. The window in the vehicles are open so your little guy can peek through! Super nice. 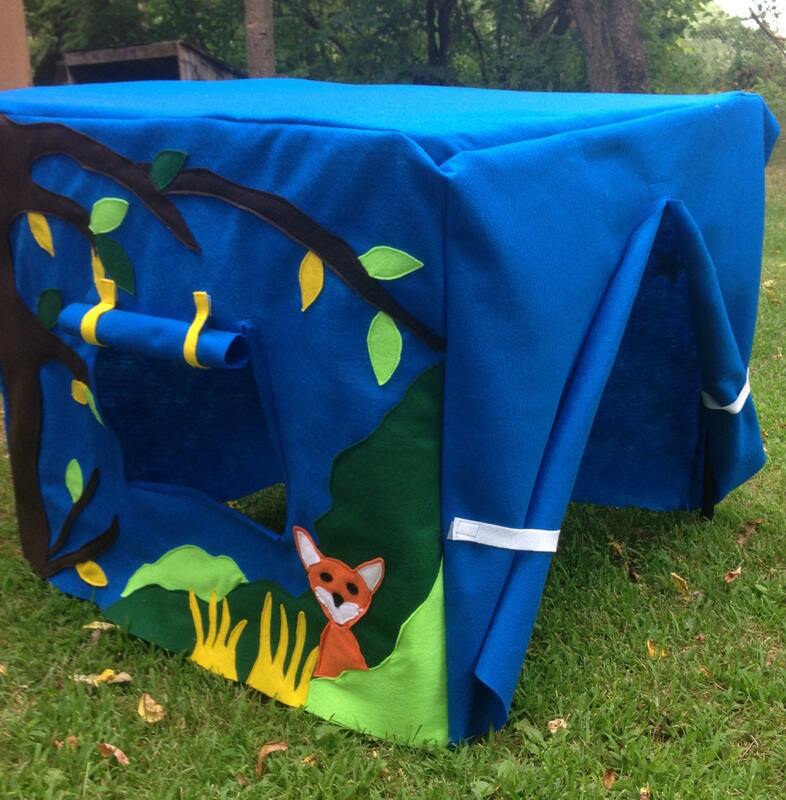 The little fox on this camping theme playhouse is adorable and it is perfect for a boy who loves the outdoors and animals. 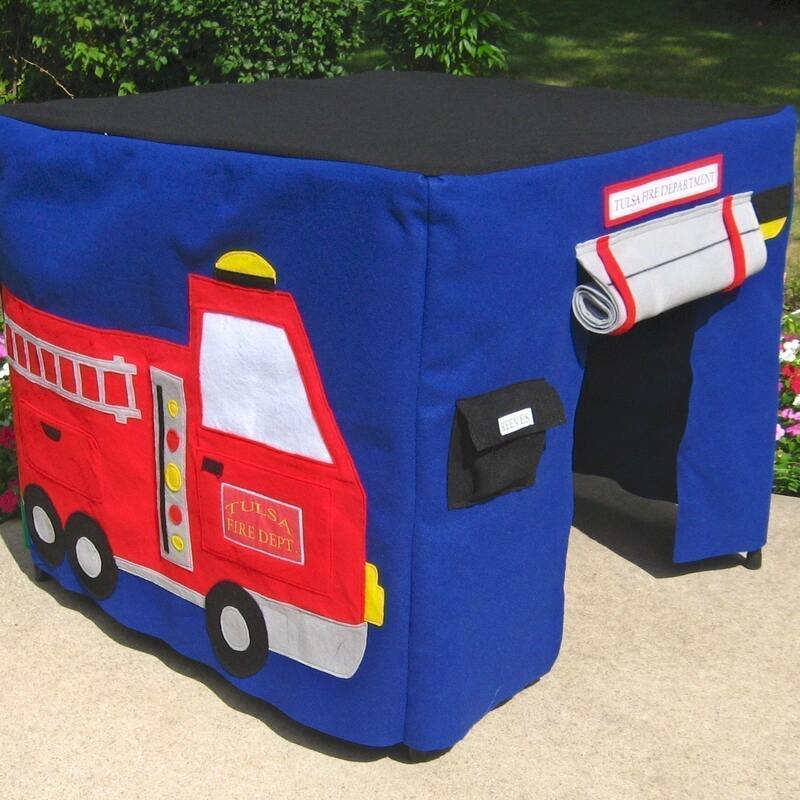 It is made of felt and the doors roll back to the sides so it looks like the opening of a tent. Clever idea! The colors are perfect on this one as well. 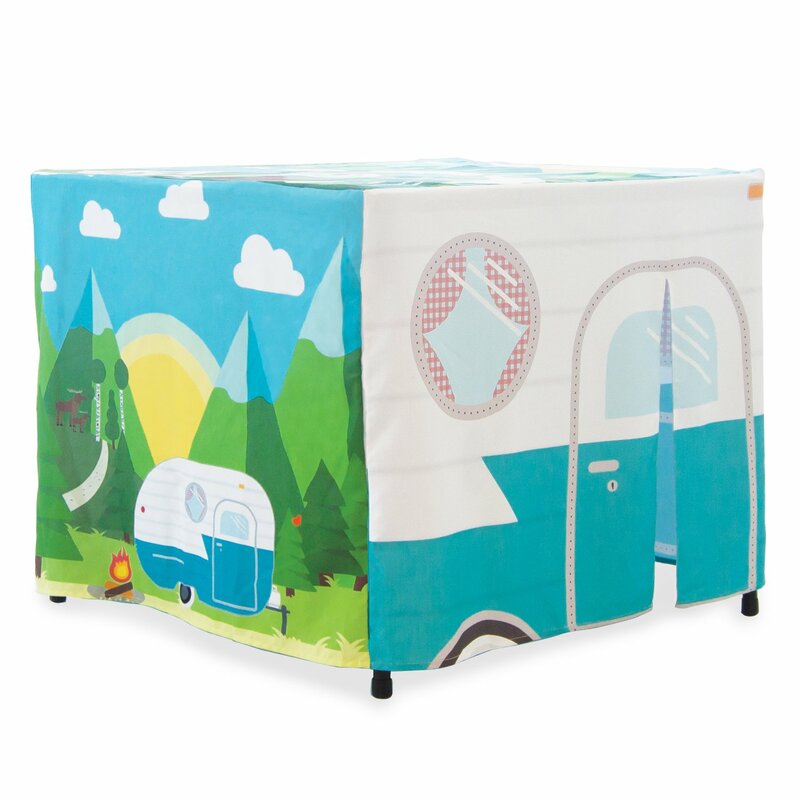 There is a colorful campfire on one side and the windows roll up like a tent window would as well. He will feel like he is camping under the stars! This playhouse is designed to look like a camper. Not just any camper but those oh, so cool retro campers. It is made of polyester and is light weight. The top of this fort is printed so they can also play with items on top of it. Pretty neat! While the quality of this is not on par with the felt ones, the price is awesome. Under the sea! 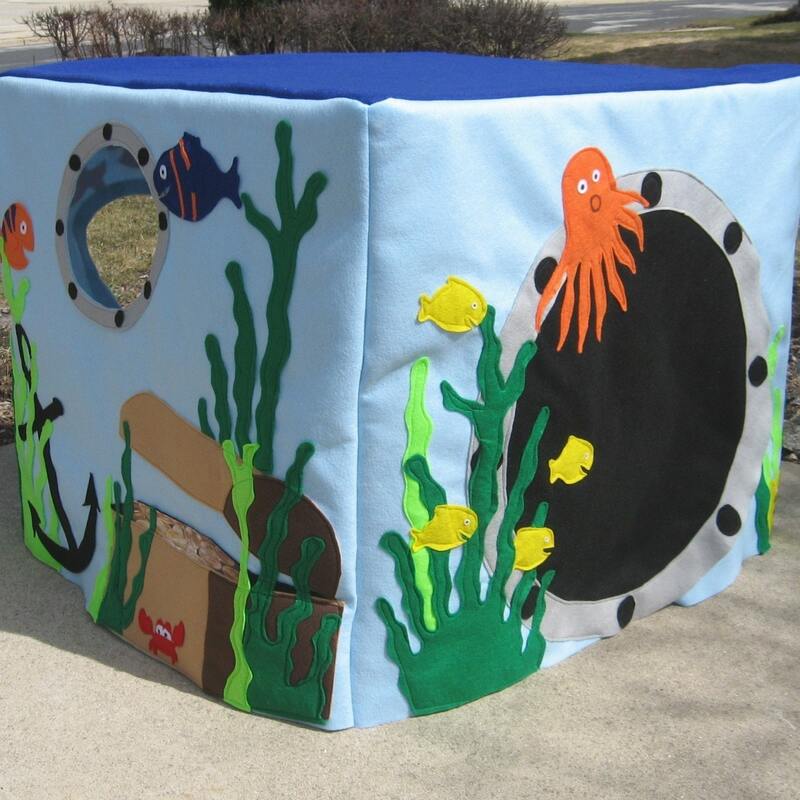 Your little ocean fan will love the fish and octopus on this nice card table playhouse for boys. It is hard to pick my favorite feature! Is it the portholes or the treasure chest? Both are super! Click through to see the other sides. You don’t want to miss the seal! Now we go under the sea, down, down, down in our submarine. Don’t fail to notice that it is a yellow submarine – love that! Seriously neat idea. I love how colorful this one is. You can’t see it in this picture but there is a red octopus on the back sporting an eye patch! This house is made from polyester, is lightweight and comes with a carrying bag. And even better, it is one of the least expensive card table forts out there. I found one with a tractor for you! I know how much boys love tractors, farms and farm animals so I had to include this gem. There is a mailbox at the front door and it comes with four letters so you can deliver mail to his farmhouse. There is even a little window to peek through under the horses head. Great felt construction and a storage bag too! The cow says Moo! The sheep says Baa-baa! 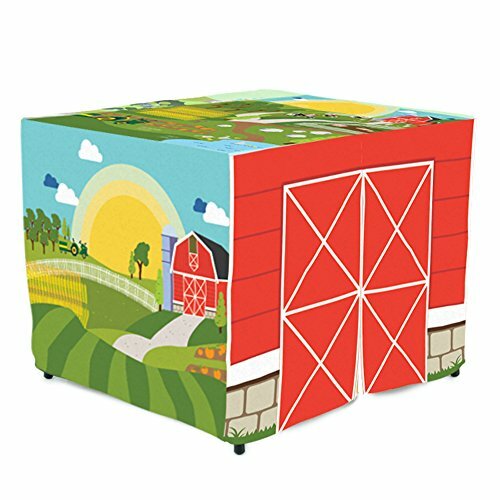 And everyone is going to say “oh, how cute!” when they see this farm card table cover. The colors are very vibrant on this one with the rolling green farmland and the bright red barn. Each animal has its animal sound written above its head. The table top is just right for this animal set. Give both together for the perfect gift a young farmer will play with for a long, long time. This is an inexpensive choice worth exploring. 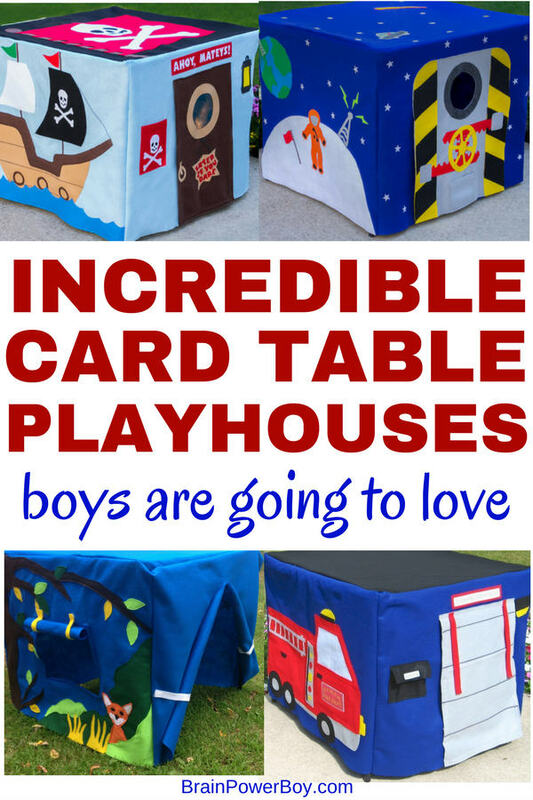 I hope you found just the right card table playhouse for your boys. I took a lot of time to find the best ones out there. Everyone I know who has one of these says it was one of the best purchases ever and we used our house for years and years. If you didn’t find the exact house that would be right for your boy, perhaps you would like to make your own! We have a post on patterns that you can check out.